A makeup train kit is a makeup accessory that lets you carry and store your beauty products. Most makeup train cases are rectangular or square in shape, and they have different compartments where you store your beauty products. This stylish Shany mini make up train case comes in twilit, dark black, and baby pink colors to let you choose your favorite. The makeup kit measures 9.6 inches long, 6.8 inches wide, and 7.3 inches tall. Its frame is made of aluminum, a sturdy material that is dust and spill proof. Its lightweight nature gives you the ability to transport it anywhere with ease. The makeup train case has a mirror that lets you apply your makeup. Its lock secures your beauty products from loss. The makeup train case looses its balance when you put relatively heavy products on the top shelve. This mini makeup train case from Homdox is made of aluminum and stainless steel, sturdy materials that last long. Its dust-proof and waterproof nature shields your beauty products from outside elements that can contaminate or damage your cosmetics. The makeup train case has various compartments where you can store your cosmetic products separately. Homdox’s mini makeup train case measures 7.8 inches long, 6.05 inches wide, and 6.05 inches tall. The makeup train is balanced to maintain stability while it is open. Its lightweight nature allows you to carry it while you travel. Homdox make up train has a lock that lets you lock your cosmetic products safely. Its small compartments may not allow you to store items like brushes. 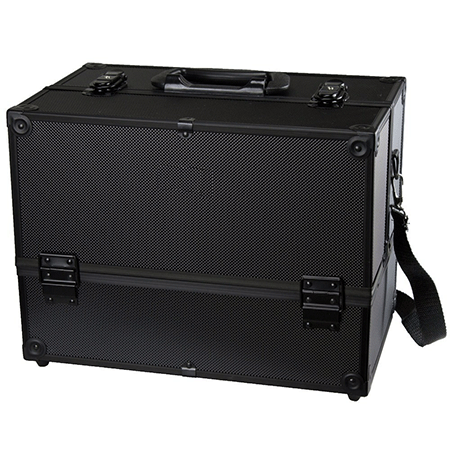 This professional makeup train case from Travelmall measures 16.5 inches long, 11.4 inches wide, and 5.5 inches tall. It is made of a nylon fabric that is lightweight, waterproof, and durable. 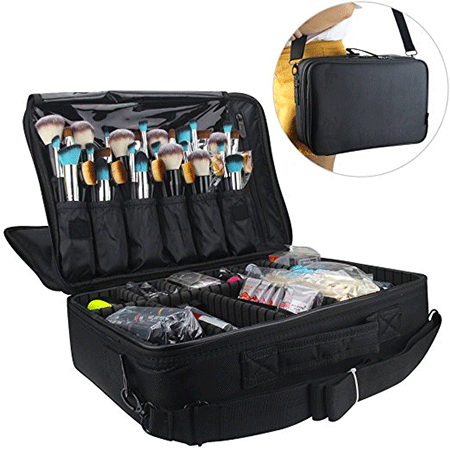 The professional makeup train case has three layers and movable partitions where you can store your makeup brushes and other beauty products. It has a large compartment where you can store your beauty products. The nylon fabric is easy to clean. You can carry it on your back, shoulder, or like a handbag. Its zippers may fail after a period of use. The ROWNYEON portable travel make up case measures 8.3 inches wide, 9.8 inches long, and 4 inches tall. This compact makeup case is designed from plastic, Velcro straps, sponge, and an oxford fabric. Its interiors are lined with a waterproof fabric that protects your cosmetics from water. Its compact size and lightweight nature lets you carry the makeup case whenever you are traveling. Its design is suitable for men and women. The makeup train’s shake proof nature shields your cosmetic products from spillage. Its adjustable internal compartments give you the freedom to adjust each compartment according to the size of your cosmetics. Its zipper is not sturdy enough. Therefore, it may fail after a period of use. This case measures 13 3/8 inches long, 8 5/8 inches wide, and stands at 9.5 inches tall. It is made of a durable aluminum frame that is waterproof and durable. The bottom of the makeup train case features transparent plastic that allows you to clean the makeup train case just in case of a spill. Its large capacity lets you store various cosmetics like foundations, makeup brushes, and any other makeups. 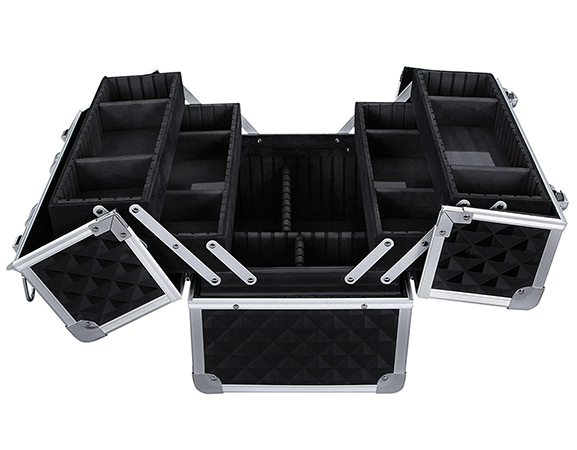 The makeup train case has eleven adjustable compartments that allow you to store cosmetics of any size. Its 2.72kg weight may feel bulky. This gold colored cosmetic train kit is made of an aluminum frame and steel corners. These materials make it a sturdy makeup train kit that will serve you for long. Its interior is lined with a velveteen material, and it has two removable drawers. The makeup train case measures 11.5 inches long, 7 inches wide, and 8.5 inches tall. It has a carry handle that lets you carry the makeup train around. This cosmetic makes up train kit is available in pink, teal, and blue colors. It has a lock to keep your cosmetics and beauty products safe. The drawers are difficult to close and open. This portable makeup train by SONGMICS is available in black and pink colors. It features an aluminum frame and reinforced corners. It measures 9.5 inches long, 6.75 inches wide, and 7.5 inches tall. Furthermore, the portable makeup train has a transparent plastic bottom, a mirror, and a handle. Its color variation lets you purchase your favorite color. SONGMICS portable makeup train has a mirror to help you apply the makeup. The transparent plastic bottom is easy to clean. SONGMICS portable makeup train can tip back when it is open. This diamond texture beauty case from SOHO comes in black and silver colors, and it measures 11.8 inches long, 9.8 inches wide, and 8.5 inches tall. 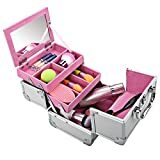 The silver beauty makeup train case is made of plastic, and it has four fixed shelves where you can store different beauty products separately. The makeup train has a sturdy handle that allows you to move it around. It features a buckle closure that locks your beauty products safely in your makeup train case. Its large size holds more beauty products. Its plastic frame is not as sturdy as those made of aluminum and or steel. 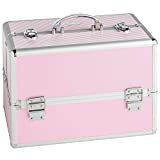 Beautify’s professional makeup train case with lock comes in pink, pink rose and silver colors. It is made of aluminum, a material that lasts long. 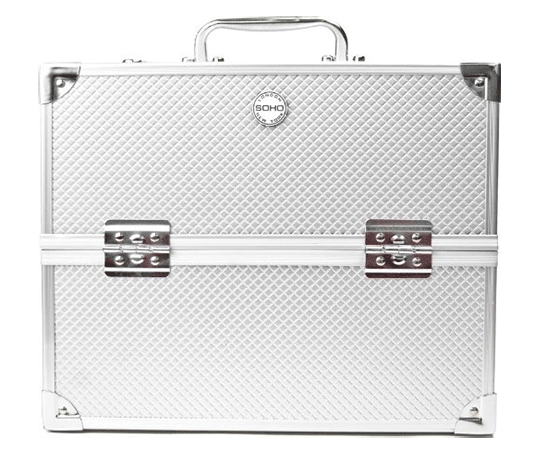 The professional makeup train case measures 14 inches long, 8.5 inches wide, and 9.5 inches high. Other features on this makeup train case include a handle, a silver lock, and its key. The makeup train case has eight compartments that let you store different beauty products separately. Its lightweight nature enhances its portability. The silver lock keeps your items safe. The makeup train’s base is not sturdy enough to hold heavy stuff. 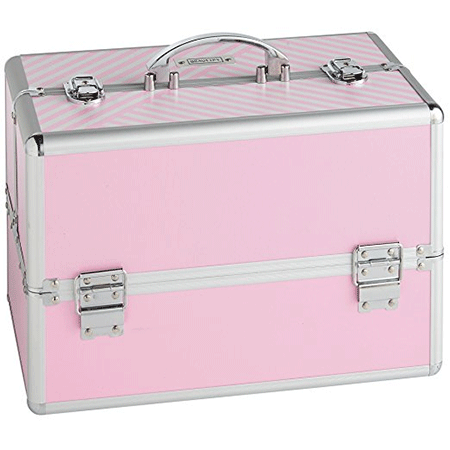 This makeup train case from Lenubo comes in black, silver, and pink colors. Its base measures 14 inches by 8.5 inches and stands at 11 inches tall. Its aluminum frame is reinforced with steel corners to make it durable. The makeup train case features two metal locks that help you secure your beauty products. 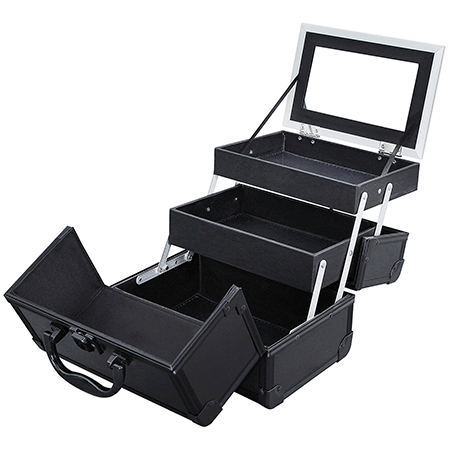 Its carry handle lets you move your makeup train case around. 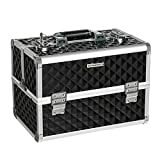 The large makeup train case lets you store many beauty products of different sizes and shapes. 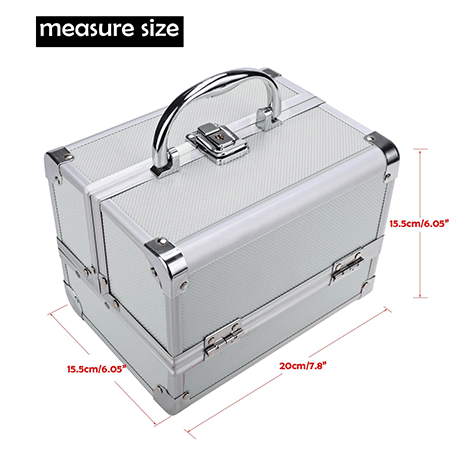 Because of its large size, this makeup train case may not be suitable for people with few beauty products. A makeup train case lets you store beauty products like makeup brushes, foundations, lipstick, nail enamel, and ornaments. 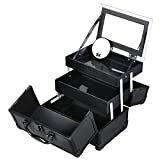 The secret to getting the best makeup train case is to purchase one that is sturdy, has enough storage space, and comes with a lock to secure your beauty products. Our reviews will help you to buy one that suits your needs.